The eye surgeons at our Corinthian Pointe LASIK surgery eye center have extensive experience in the pre-operative evaluation and post-operative care of LASIK and other vision correction procedures. By far, LASIK is currently the most popular vision-correcting or “refractive” surgery available. But there are other options as well. We will help you find the ideal solution for your problem and partner with the best surgeon to perform your procedure. An instrument called a microkeratome is used in Corinthian Pointe LASIK eye surgery to create a thin, circular flap in the cornea. Another, newer way of making the flap is with a laser. The Corinthian Pointe eye surgeon folds the hinged flap back out of the way, then removes some corneal tissue underneath using an excimer laser. The excimer laser uses a cool ultraviolet light beam to precisely remove (“ablate”) very tiny bits of tissue from the cornea to reshape it. 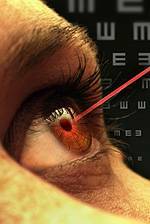 Both nearsighted and farsighted people can benefit from the Corinthian Pointe LASIK procedure. With nearsighted people, the goal is to flatten the too-steep cornea; with farsighted people, a steeper cornea is desired. Excimer lasers also can correct astigmatism by smoothing an irregular cornea into a more normal shape.